It’s Mature Moggies Week (13-17 November), a chance for Cats Protection to raise awareness of the older cats that take four times longer to home than their younger counterparts. It’s clear that the health of mature moggies is a major worry, but the reality is that cats are living longer thanks to advances in their care. Average life expectancy has risen and quality of life has improved, with many cats living into their late teens and even early 20s in great health. For extra peace of mind, all current residents of Cats Protection have received a full health check and come with a full medical history. If you’re already the lucky owner of a mature moggy, Cats Protection has put together some top tips to help you care for them. Get bi-annual vet checks – many vets offer regular health checks for cats aged 11 years or older that include blood pressure measurement and urine testing to ensure any issues can be detected early. Conditions such as arthritis, dental disease, diabetes and kidney disease are all treatable and are better identified earlier than later. 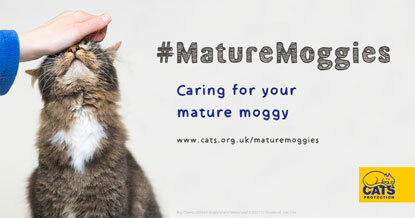 Speak to your vet about how often your mature moggy should be checked over. Provide an age-appropriate diet – older cats prefer to be fed little and often and lots of commercial pet food brands offer a 'senior' product tailored just for their nutritional needs. Speak to your vet about ensuring your cat has a suitable diet and remember to make any changes slowly. Check for signs of pain – with your cat’s eyesight and hearing likely to deteriorate in old age, their environment will need to be adapted. Make sure all of your cat’s resources (food, water, bed and litter tray) are in easily accessible locations and look out for signs of stiffness and a reluctance to jump up or down, as these could be signs of arthritis. If you spot these signs or any other changes, speak to your vet. To find out what sort of care your cat needs, take our Mature Moggies quiz. Simply enter your cat’s age and we’ll give you some advice for ensuring they stay happy and healthy.